Poor fit, oversize or unusual embellishments, or an unfortunate color can make an otherwise "okay" dress downright ugly. You may have a hideous dress in your closet that you inherited as a hand-me-down, had to wear as a bridesmaid or purchased on sale for such a low price that passing it up seemed silly. With only a few adjustments, you can make even the ugliest of dresses into a thing of beauty. Try the dress on. Mark where you want the dress to hit. Keep in mind that a dress that falls to a narrow part of your leg (such as just below the knee, mid-calf or just above the knee) looks more flattering than a dress that hits at a wider part of your leg. Trim any excess fabric off the length of the dress. Fold the bottom edge over about an inch, and hem. Make the dress longer if you need to by adding a length of contrasting fabric to the hem. Add a simple belt to the waist of the dress to make a baggy, oversize dress fit better. Cut off a large bow if the dress has one. Use a seam ripper to gently remove any embellishments, such as a sequins or fabric flowers. Be careful not to rip the fabric of the dress. Dye the dress if it is made of a natural fiber. You may need to bleach the dress first, then use fabric dye to make it a more flattering color. Add any embellishments that you like to a boring dress. 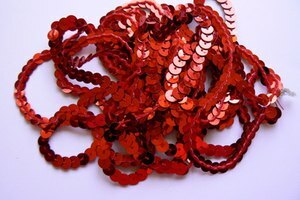 You can stitch a row of sequins onto the hem of a plain dress or thread a piece of satin ribbon through the neckline.